According to local reports, the Venezuelan customs authorities would now confiscate mining equipment, including miners, graphics cards, and computers, that arrive in the country by sea, air, and land routes. The rule was levied with immediate effect. To prevent any surprise setbacks for customers, the country’s major shipping companies have updated their websites with the new rule, prohibiting the entry of miners in the South American nation. Liberty Express, a shipping giant that until recently shipped miners to the country, noted that mining equipment could no longer enter the country, and recommended customers not to attempt to send the items, else they would end up facing a loss. While shipping companies are themselves not responsible for policing imported goods, Venezuelan authorities are infamous for their handling of imports, with citizens regularly reporting opened packages, incomplete orders, and package theft. Interestingly, the situation is more prevalent in airport customs. Thus, their notice to customers is indeed benevolent. As observed, Venezuelan President Nicolás Maduro has maintained that the country is a pioneer in the digital currency ecosystem and expressed Venezuela’s cryptocurrency push in worldwide conferences after the launch of controversial state-backed cryptocurrency, the petro. However, the statements lack credibility, as several irregularities have been noted in the country’s dealing with cryptocurrencies on a local level, especially that of making access to digital currencies difficult for citizens. Until the ban, cryptocurrency mining was a means to generate income for several citizens, who cope with the country’s economic crisis. Additionally, the country was considering setting up mining rig manufacturers on their soil, to not rely on foreign equipment. 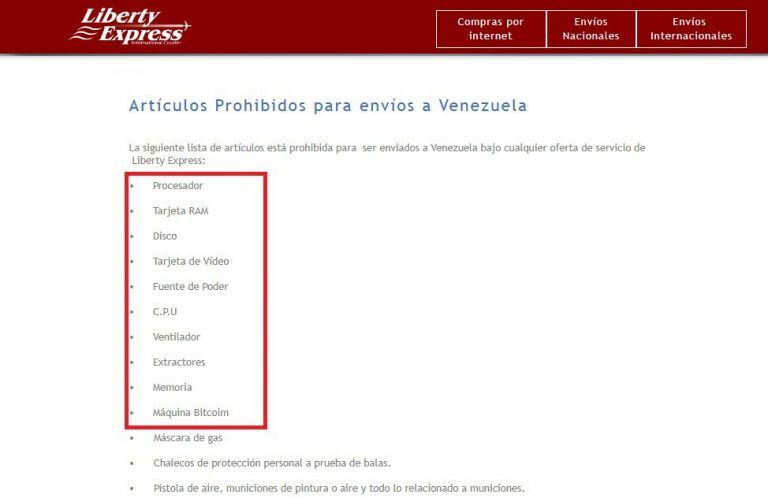 The post Venezuela Bans Imports of Cryptocurrency Miners appeared first on BTCMANAGER.